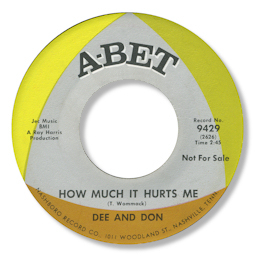 Male/female duo Dee and Don only seem to have had one 45 issued. The Memphis toe-tapper “I Can't Stand It” forms a good contrast to the high quality deep How Much It Hurts Me on the other side. Great rasping vocals from Don, and the tough toned Dee really compliments them. UPDATED ~ Jim O'Neill has kindly written with more info on "Don". He says "His real name is Homer McMinn, better known now as Papa Don McMinn, a regular performer on Beale Street since the 1980s. He has been called "the Pale Prince of Beale Street" and "The Boogie Man." He is a white singer and guitarist originally from Kansas, where he made a 45, "Mary Jane," in the 1960s on the Runnin' Wild label under the name Tiny Lymon & the Jukes. He's mostly known for blues and boogie but also does country, rock and R&B." I'm grateful to Jim for this - very helpful. Does anybody have any onfo on "Dee"? Note ~ The Ace UK CD “The Heart Of Southern Soul Vol 1” includes the previously unissued “Mr Fortune Teller” a solid slab of southern funk. “I can’t stand it” is on Vol 2 of the same series of CDs.